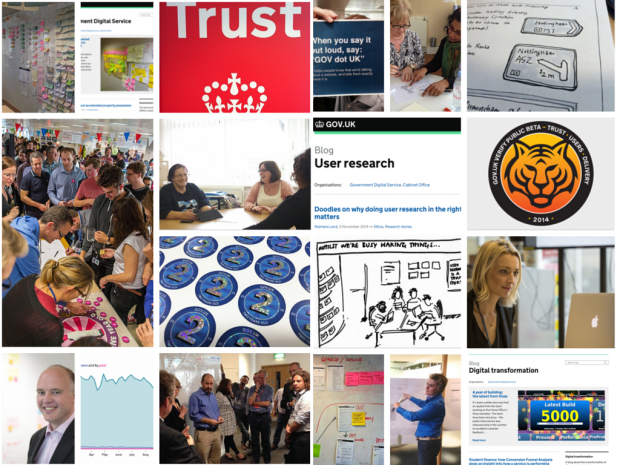 If you're interested in our work, don't forget that GDS has 14 blogs including this, the main one. For a flavour of some of the things we've been up to lately, here are 5 (spoiler alert: it's really 6) recent posts from some of the others. You can see the latest from all government blogs at www.blog.gov.uk, where you can search or filter by organisation. On the GDS data blog, here's Matt Harrington on a new app to build and deploy Performance Dashboards without the need for developer time. On average a new dashboard took us weeks to develop. The app means we can create one in minutes. Lindsay Brown and Jim Williams have taken to the Digital Transformation blog to explain the importance of Conversion Funnel Analysis to improving services. By looking at how many users are dropping out of a transaction, and where (that's the funnel), you have a better idea of what to fix first. In one case, the proportion of users progressing from a particular page leapt from 27% to 81% thanks to this sort of analysis. Over on the GDS design notes blog, Rebecca Cottrell has written about how designers at GDS prototype in HTML, and why that's nothing to be afraid of. A prototype does not mean code must be perfect. In fact, it shouldn’t be: the majority of time should be spent iterating the design, not making code beautiful. Prototypes are made to be tested and iterated (and if they fail, thrown away). On our social media blog, Georgina Goode sounds a note of caution against jumping feet-first into new social networks, merely because they're new. Understanding the actual size of specific audiences on each channel is key. Like any channel, you need to go where your users are spending time. Sounds obvious? It is. And yet, in some cases, hard numbers are still not being used to make social planning decisions. On the Inside GOV.UK blog, Jake Benilov has written about the release of info pages – counterparts to many of the pages on GOV.UK which display useful information, including the user need that the main page its associated with should meet. Publishing the GOV.UK user needs should also make the team’s work more transparent and traceable. Eventually, there shouldn’t be any GOV.UK page without a validated user need. There’s an “info” page for most GOV.UK pages. To access one, just insert /info after www.gov.uk in the URL eg the “info” page for www.gov.uk/apply-uk-visa is www.gov.uk/info/apply-uk-visa. Here's Leisa Reichelt at the user research blog on the art and/or science of sticky notes, from colour, to pen thickness, to the quality of your adhesive, through the lens of user research. There’s nothing more annoying than having your sticky notes rain from the walls while you’re trying to do analysis. When it comes to sticky notes, the glue really matters and you get what you pay for.